Back in November, Matthew Schaefer found himself down on his luck, forced to sell his home—a Toyota Land Cruiser—after a breakup with his girlfriend, tough times finding a job, and bad weather left him feeling hopeless. But after we shared his heartbreaking Craigslist post, Jalopnik readers stepped up to give him a hand. The Land Cruiser featured in the “Emergency Sale 1992 Toyota Land Cruiser FJ80 4x4" Craigslist listing has been sold. Matthew Schaefer—who found himself penniless, cold and alone in the mountains of Bishop, California six months after leaving his day job to live in a Land Cruiser with his girlfriend—had to get rid of the truck to make some money and reset his life’s trajectory. That buyer, named Mark, is a Chicagoan who got in touch with Matt shortly after our story went up, and offered him $3,500 for the Land Cruiser—a number that Matt thought was fair, and definitely enough to help get him out of his sticky situation. Matt took Mark up on the offer, though it took the latter a couple of days to get all the way out to Bishop to seal the deal. In the interim, Matt tells me dozens of other Jalopnik readers reached out to buy the Toyota. “Like 50 people lined up to buy the truck,” he told me, clearly grateful for the help he’s received. “I’m still in contact with a few of them. We’re Facebook friends, and we make fun of my Land Rover Now.” (More on the Land Rover in a sec). After a couple of days, Matt says Mark—whom I was unable to get in touch with for this story—flew to California, met up with Matt, and the two did a bit of off-roading to test out the Land Cruiser. The two stayed in the same motel (Matt could afford the motel thanks to generous donations from readers), and then drove all the way back to Chicago where, according to Matt, he’s been driving the Toyota ever since. Where is Matt today? Well, after selling the Land Cruiser, and after accepting about $90 in donations from Jalopnik readers, Matt jumped on a Greyhound bus headed to Oregon to work near a friend. But eventually, he had trouble finding places to stay, and decided to move out towards the coast to Newport, a town through which he and his ex-girlfriend had traveled a few months prior. So it seems like Matt is doing a lot better than he was a few months ago, when he was freezing all alone in the mountains in his Land Cruiser, praying someone on Craigslist would buy his SUV so he could get everything back on track. Now it seems Matt is indeed “back on track.” Well, at least in his mind, that is. 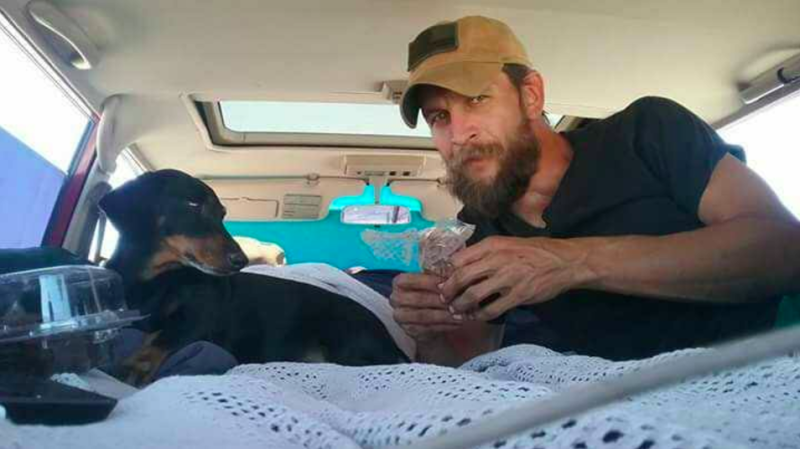 He said that, after getting to the warmer weather in Oregon, and buying a good sleeping bag, he’s been able to handle living in his vehicle much better than before. Matt’s long term plan is to continue moving around mountain and seaside towns. “When one really speaks to me,” he said, I’ll kind of look back at them and decide which ones were dearest to my heart...I’ll return to one of those and maybe try to settle down.” In the meantime, he plans to continue “taste-testing” the west coast. But as of now, he’s doing well, especially since his monthly expenses are down to $240 per month (plus food). “I’m doing fine,” he said. “I am making the money I need to continue this lifestyle,” he told me. “So this 40 hour a week job—I’ll actually get to live lavish.” All the money he saves he’ll be able to spend on car modifications and food, with one of his first planned expenses in the former category being a straight-pipe for his Land Rover’s V8. Just to listen to that sweet, sweet sound. “A lot of people on YouTube have straight-piped it, and it pops and spits so nasty when you get off the gas—crackles. And I need that in my life. I need a little fun,” he told me. Matt made it clear during our conversation just how appreciative he was of the Jalopnik community. “It was really cool that your whole community reached out,” he said, telling me that he actually had hour-long conversations with some of our readers over the phone. Sell Your Reliable Car and Buy A Junky One. It Will Improve Your Life.